The journey between marketing a property to a Tenant moving in is a relatively quick one compared to a residential sales transaction and it is vital that you choose an efficient and knowledgeable agent that will ensure all the correct procedures are taken to the latest regulations. Before we even arrange a viewing, we like to establish that all potential Tenants will meet the standard criteria by asking a few general questions. We will accompany them around the property and if they would like to proceed we ensure that we have all necessary information such as employment details, current Landlord and tenancy arrangements and any anticipated move-in dates. Finding out this information from the start will save us time and save potential Tenants’ monies for referencing and administration. We use an independent referencing company called Rent4Sure that will carry out employer referencing, Landlord referencing and a credit check. We have access to their notes as the process takes place and we will keep you updated accordingly. However, before any referencing commences we will carry out a full right to rent check to ensure the Tenant has the right to rent in the UK. We will also supply them with a draft Assured Shorthold Tenancy agreement (AST) at this stage, this will give them enough time to read through it and become familiarised with their responsibilities. Two copies of our ASTs will also be given to our Landlords to read through and sign before the Tenant moves in along with any other relevant paperwork. This is the agreement between the Landlord and the Tenant. An AST can range from the minimum of 6 months to the maximum of 3 years. We recommend the first AST is for 6 months and then is either renewed or continues onto a periodic tenancy. It is most important that an inventory of contents & schedule of condition is prepared at the commencement of the tenancy, in order to minimise any misunderstanding or dispute at the end of the tenancy. Without these safeguards, it will be impossible for the Landlord to prove any loss or damage to the property or its contents. In order to provide a complete service, we will arrange an independent inventory Clerk to prepare an impartial inventory & schedule of condition. The inventory production charge is borne by the Landlord and the inventory check out charge is borne by the Tenant. This will include meter readings where possible. 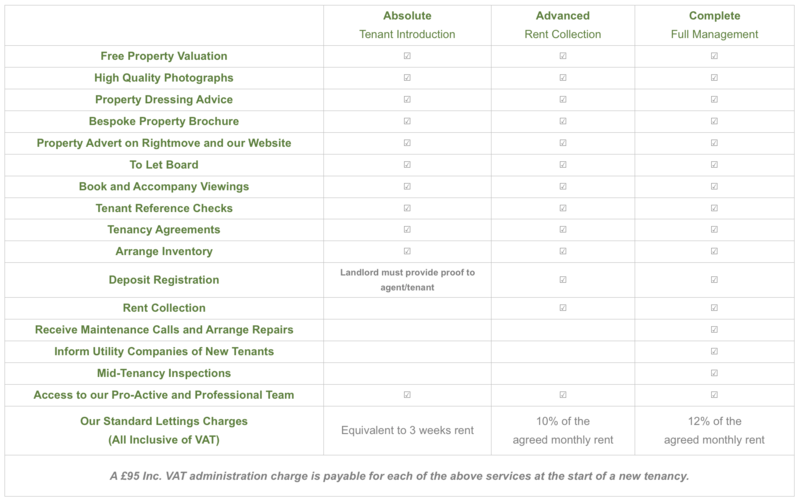 When choosing our premier letting service all utility companies will be made aware of the new property occupancy and meter readings are given for their records. The deposit can be paid by the Tenant either before, or on the day of move in. We will register the deposit with the Tenancy Deposit Scheme (TDS) once it has been received and all relevant documentation will be given to the Tenant and Landlord. The Tenant’s monies will be held in a segregated client account and proof of this will be supplied upon request and given to the Tenant. To comply with legislation a valid gas safety certificate must be provided to the Tenant to show the property is gas safe. An Energy Performance Certificate (EPC) will also need to be supplied. From April this year a new legislation came into place which requires an EPC energy efficiency rating of E or above. Please contact us for further EPC advice should you have any queries. A working smoke alarm and carbon monoxide alarm must be installed on every floor of the property where applicable. We will test these alarms on the morning of the move in day to ensure that they work. Tenants will also be made aware that it is their responsibility following the move in day to test them regularly and report any faults to us as their letting management agents or to their Landlord directly. Depending on the level of service we provide to you, we will then continue to either collect the rent or fully manage your tenancy. Our fully managed service will include regular inspections of your property, processing monthly rental payments, negotiating rent increases, arranging gas safety certificates and general maintenance when required. We will always keep you updated following any property inspections and maintenance issues. Your holding deposit will be added onto the final deposit on the day that you move in, however, should you not move into the property at no fault of the letting agent or landlord the holding deposit is non-refundable.